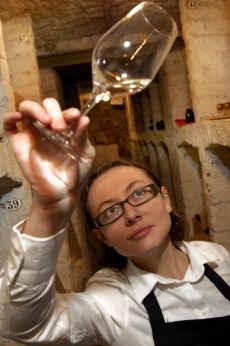 Interview with Pascaline Lepeletier, sommelier at Rouge Tomate, part 1. This is an interview conducted with Pascaline Lepeletier, the sommelier at Rouge Tomate. The original Rouge Tomate was opened in Brussels in 2001, and the New York version opened in 2008. The philosophy of the restaurant is S.P.E. (Sanitas Per Escam, health through food), and the menu features a staggering array of local, seasonal, healthful, and delicious food. Pascaline has crafted a wine list that’s every bit as natural as the food, and as someone who educates about natural wines to a lot of customers, I wanted to sit down and chat with her about how she does it. This is part 1 of the interview, part 2 will be featured next week. When did you start at Rouge Tomate? It’s almost 4 years now. I started more in an executive position to create a nutritional beverage program. At that point I was in Brussels. Then I came here to help with the opening, which happened in October 2008. At that point there was an American Sommelier and a beverage director. That sommelier left in March 2009, and I took over in June. What was the list like when you took over? It was much shorter, and there was a lot of American wine on there. We didn’t have the same vision of wine, so I’ve had to clear a lot of those wines out of there. There was just a little bit of natural focus on the French side, and some American, but there were some quality issues I had to deal with. Was it hard for you to convert the list over? Did you have resistance from the people above you? No, not at all. I had to do it slowly, but as I started working with it, we began to sell more and more wine, and our costs went down as well. At this point I know my director is very happy, and we are going to do much much more, this is not the end at all. Now I have total freedom to change as much as I want. At first when I started I was super into these kind of wines, but I learned I had to tone down the intensity a bit, to create more of a dialogue with the directors about the wines. And now all of them are into the idea, and they’ve even visited some of the wineries, like Coturri. It really fits with the philosophy of the restaurant too, with the style of the chef. We are really involved in selecting the ingredients and it’s very important that the quality be very high and at a good price. Some people forget that the thing about organic, natural and biodynamic wines is that it’s an amazing quality of product for the price you are paying. When you think of a wine like the Deux Anes L’Enclos, I sell that wine for $45 a bottle, and it’s such a high quality of wine for that price, it’s like a grand cru wine! Or a wine like Chateau Tire Pe. I think the quality of that wine for the price is absolutely amazing. It’s organic, hand harvested, and just great quality of wine. When you think about the grand crus that are all machine harvested and not organic, and they are four times the price, it’s really something there. That’s a great wine to start with if you want to try organic wines, it’s perfect. It’s gorgeous, deep, balanced, complex, and super accessible. Everybody can like that wine. I’m very proud to have these wines on the list. I don’t have the balls to go and make my own wine. But I’m very happy to support their work. Sometimes it seems artificial to some, to be in this cool restaurant in New York, selling these wines. But in fact you can be a window for them, to help promote them and what they do, I am super proud to be able to do that. Sometimes it’s a personal relationship even, because I know them. But it’s more than that. Even if you’re not close to them, like if you think about the way they work to make a great product, it’s really inspiring. I think the concept of the restaurant is great, and that’s the reason I am here. I’m happy to go to work every day and be part of this kind of commitment to good food and wine. How did you get into organic, natural, and biodynamic wines? It was very easy actually. I started to get into wines very late, after a progression led me to wine, and I did a very basic diploma of wine in France, in Angers (in the Loire Valley in France). My teacher was very into these kinds of wine. The first harvest I did was in Anjou with Domaine des Griottes, so I was into it right in the beginning. So when you first started, had you already tasted lots of natural wines? I was interested in wine, and I had worked at a super high-end catering place, so I was tasting big, well known wines, the famous conventional names everyone knows. As I was getting into wine, I went to Anjou on the weekends to visit vineyards, and started to taste at places like that, and I liked these wines, right from the beginning. I remember going in the vines and tasting with the winemaker, just to taste the grapes and I thought right away that there was something in the wine that was very special. The first Domaine des Griottes I tasted was like that, then I started to taste others, like Courtois, Robinot, Cousin. I didn’t know anything really at that point. What do you think about winemakers that don’t use any sulfur at all? The sulfites question has so much importance placed on it now. I think that the winemaker that doesn’t put any sulfites has to be an amazing wine grower, with amazing quality of fruit in the vineyard and they have to be an amazing winemaker as well. You have to be super clean, have perfect grapes, and to be honest, most of them have to have some kind of temperature control. I think once the bottles leaves the cellar though, the winemakers are not in control, so for me to just put a little bit of sulfites in the bottle, to make sure the wine travels safely, I don’t see it as a problem. I do think that one of the keys for wines made without sulfites is very long aging, which they require before they are really stable. Have you ever been able to taste the same wine, one with sulfur versus without, side by side? Yes, I did a tasting with Richard Leroy in Anjou, I tasted the 2005 vintage side by side. The unsulfured one definitely had an intensity the other didn’t, but it is very important to note that the bottles never left his cellar. I did also taste the cuvées of Thierry Allemand in Paris though, the two bottlings with and without sulfur, and those of Jean Claude Lapalu as well. Those are different as well, because they are red wines, so they do travel better. I honestly think that the question of sulfites has to be put in perspective, because it’s not the only important thing, If you don’t want to use sulfites, you could for example use an enzyme to help preserve the wine, which would make chemical transformation of the wine. So it’s a bit of a byzantine discussion for me. Stay tuned for Part 2 next week, when we’ll discuss the wine list at Rouge Tomate, and really get in depth about how Pascaline works with natural wines in the restaurant.